The Walking King Crab is an eight legged solar powered walking robotic creature. 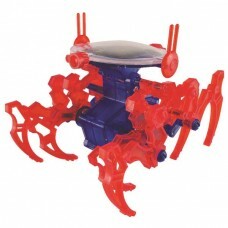 Build a Walking King Crab with this educational mini solar science kit. The robotic crab features eight legs that work in harmony to create a unique tippy-toe walking motion. The King Crab is powered by a small solar cell. This is a kit that assembly of less than 35 parts. The completed Walking King Crab kit measures 3.5 x 3 x 3 inches. It is completely solar powered and does not require batteries.